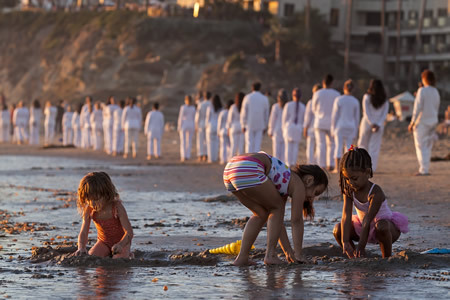 Not even Lita Albuquerque’s unusual procession last November could distract these beach-goers. Photo by Mitch Ridder. The year just concluded was a good one for the Laguna Art Museum and 2015 promises to keep pace, forecasts Executive Director Malcolm Warner. He was particularly optimistic about the future of “Art and Nature,” a symposium and exhibition where artists and scientists search for common ground. Now in its second year, the recently concluded event drew 1,514 visitors to the museum in four days. “I am encouraged by those figures and think the event is going to get better and better,” Warner said. A film screening, panel discussions, lectures, a concert and family festival helped fill out attendance. Artist Lita Albuquerque’s performance piece “An Elongated Now,” awed countless viewers on Main Beach. The year was one of spectacular exhibitions for the museum, most notably “Wayne Thiebaud: American Memories.” “I am so proud of our friendship with Wayne Thiebaud. Most museums our size would kill for association with this giant of contemporary art,” said Warner. What will be missed in coming years however is “ex.pose,” an exhibition series started by the museum’s curator of contemporary art, Grace Kook-Anderson, who introduced emerging or overlooked artists. “Putting a show like ex.pose together is an emotional experience for both artist and curator and Grace could deal with that. We will miss her flair and professionalism,” said Warner, of Kook-Anderson, who leaves the museum this month. The museum has begun curatorial work for its contribution for the second installment of Getty Pacific Standard Time, exhibitions at museums throughout the region. Laguna’s will include art from Latin America, said Warner. If the museum lost a curator, it gained Genny Boccardo-Dubey, a newly minted deputy director for advancement. 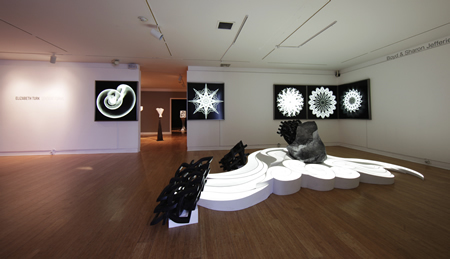 Work by Peter Alexander, a star of the Light and Space genre, earns a spotlight at the museum in 2014. In the realm of gains, the museum acquired several works for its permanent collection by Thiebaud, Billy Al Bengston, Albuquerque and Helen Lundeberg, 38 drawings and prints by Fredrick Hammersley, Don Suggs and Peter Shelton. 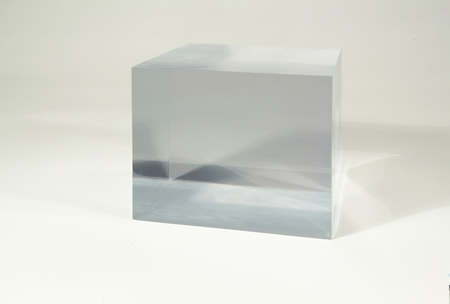 A resin cube by Peter Alexander was purchased by rather than gifted to the museum. Museum chairman Robert Hayden III expressed enthusiasm about artist Tony DeLap joining the board this year. “Here is someone who has been working in Orange County for 50 years and has been under-appreciated, but is finally getting the recognition he deserves,” he said. He is also excited about the museum having begun preparations for its 100th anniversary in 2018 and next year’s Marcia Hafif exhibition. Hafif divides her time between Laguna Beach and New York. “Lotus Land,” a work in the Laguna Art Museum collection, serves as the inspiration for a dance work performed at the museum in August. The small fry didn’t get shortchanged either this year with the Third Sundays Kids Art Studio and summer art camps. Skupin said the museum strengthened their school programs by hiring Kayla Gephart, a credentialed teacher, as education assistant. “When I came to the museum in 2012, I envisioned it not only as the place where the California art could be seen but also as a vibrant cultural center. During the past year I, as well as my colleagues, have sensed that this was becoming a reality,” she said.